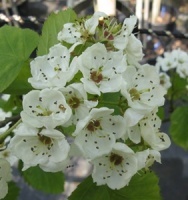 A lovely small ornamental tree with shallowly lobed leaves and large red cherry-sized berries after the Hawthorn flowers. 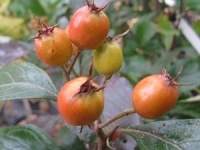 The flowers and fruits of Crataegus durobrivensis are eceptionally large and certainly eye catching when in flower during early summer. A charming small tree with deeply cut leaves, matt green above and grey beneath giving an overall effect of a light sage green. 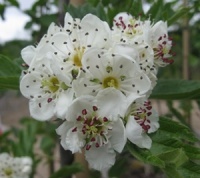 A white double flowering form of ornamental thorn. A really good small tree that flowers from an early age. It has large crimson flowers with a white centre - quite stunning! 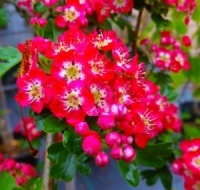 An ever-popular ornamental thorn with double scarlet flowers, makes a neat small tree. 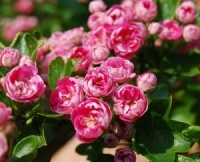 Similar to 'Paul's Scarlet', this form of ornamental thorn has pink double flowers.